It’s a simple truth. One I am reminded of every single day when I look at my kids and mark the passage of time by the micro inches they have grown over night. Time is our most precious resourse, a priceless commodity and too often we squander it like a shop-a-holic squanders money. When our time is gone, it’s gone. We cannot get it back. So we need to make the most out of the time we have. 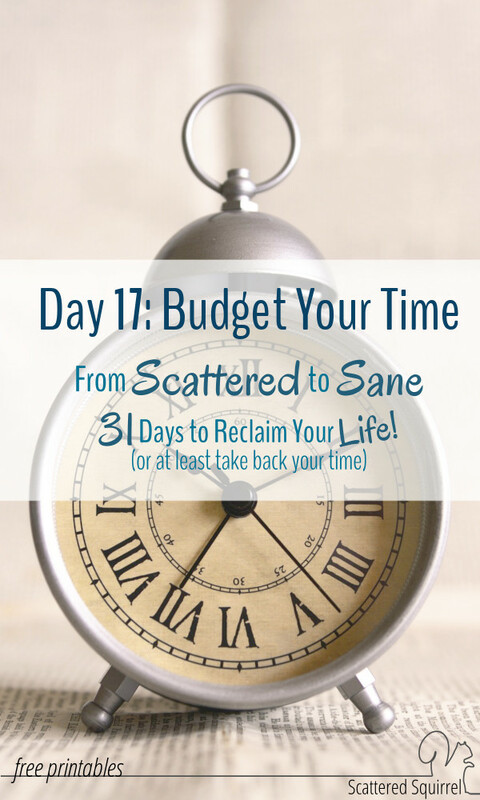 Today we’re going to talk about how to budget your time so you can make sure you’re getting the most out of every day and spend it where is really matters. Note that I said – get the most out of every day, not get the most done every day! It is easy to get caught up in the ‘busy-ness’ of life. In this day and age it often seems like people wear their busy schedules like badges of honor. I was just like them once. I filled my days with stuff to do so that I wasn’t seen as lazy or idle. No one made me feel like I had to be busy, and I’m blessed to have family and friends who don’t play the “I’m more busy therefore I’m better than you” game. It was all inside my own head. If I wasn’t busy then I must be wasting my life. Oh no! I couldn’t possible spend the little ones nap time reading a book. Are you crazy? I had to DO something. I woke up two hours early, there’s no way I can sit on the deck for an hour just watching the sunrise. I should get a jump-start on the days chores so that I can work on some other seems-super-important-at-the-time-but-I’ll-forget-about-it-in-a-week project. Yep! I totally feel into the trap of needing to be busy for the sake of being busy. Don’t get me wrong, I think that time in my life was important for showing me what I could do when I focused on doing. It also showed me just how important NOT being busy is. It showed me how important it is to take time for myself now and then, and enjoy the little things. It taught me one of the most important life lessons in my little world – time is finite. It shouldn’t be squandered on being busy with purpose. It taught me that it’s important to do the things that need doing and space out the rest. It taught me that the importance of balance and good enough. It taught me the true value of a moment. I’m going to let you in on a not so little secret. This is one of the best steps you can take on your journey from scattered to sane. You’ve created some solid foundations routines for your daily and weekly tasks. Those will help hold your course when times get crazy. But what you’re doing today in creating a time budget, is taking it all to the next level. Foundation routines will only get you so far. Before we can start figuring out how to add in tasks to our routines, we need to figure out how much time we have to work with. Many times, when life starts getting scattered, we’re trying to do too much. Maybe we’re transitioning into a new period of life and we’re trying to make everything fit together. Maybe we’ve added something new to our schedules and haven’t yet figured out what we need to get rid of to make it fit. Whatever the reason that life has gotten scattered on you, taking a few minutes to examine how you’re spending your time is an important step to taking it back! Go ahead and click the picture below to grab a copy of the printable and print one or two copies out. Remember to hit the back button to come on back and find the steps to using the time budget worksheet. If you’d rather not use the printable grab a sheet of paper and make your own. 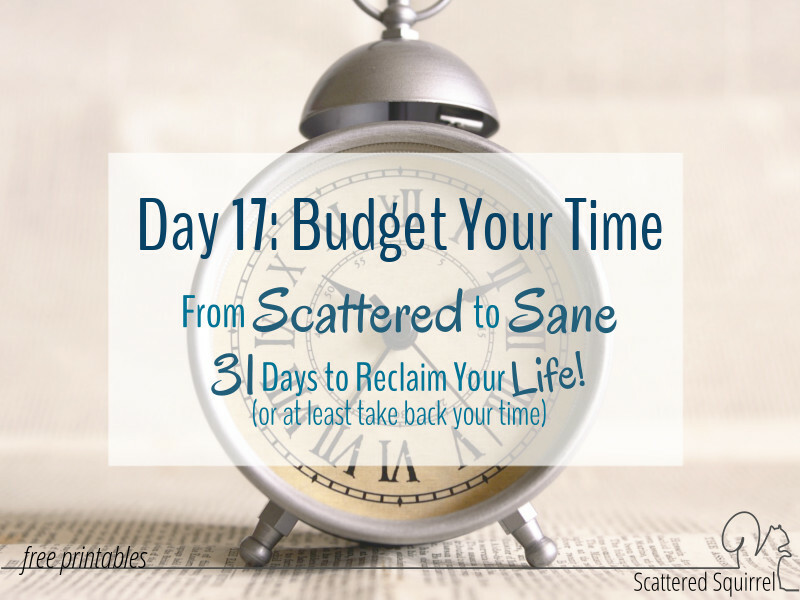 Making a time budget is a lot like making a financial budget. Start with how much time you have. You can choose to do this for a typical day or for a typical week. Write down the time you spend taking care of yourself. Now continue to fill out the rest of the lines and times with the stuff you do. Add up the total amount of time you need. If you end up needing less time than you have allowed let me be the first to say Congratulations. Because it can be really tough to find extra time in a day or week. Your task for today, is to take a look at all the things you jotted down in your list, and see if there is anything missing that you should be making time for or if there is an area you could spend a little more time one, like dedicating daily time to your hobbies, or going for a walk. Maybe you only take 15 minutes a day for yourself, could you maybe up that to 30 or be totally bold and take an a whole hour each day? If you ended up needing more than you have allowed, that’s ok. I did. I apparently need 28 hours in a day to get everything done. This is where you might want a second copy of the above printable. Take a few minutes to think about what an ideal day would look like for you, and write that down. Do you maybe spend 10 hours on work and would like to cut that down to 8? Maybe you’re like me and realized that meal times, making, eating and cleaning up take a huge chunk of the day (3+ hours), for me, I’m going to look into doubling my usual recipes so I have left overs or making meals ahead of time, or making more simple meals. Once you have that second one filled out, compare the two. What can you cut some time from? Can you delegate? Is there something you can completely give up? (NOT sleep lol) This can be the painful part, but I promise we can find some solutions. Can you lower standards a little? Tomorrow we’ll talk a little bit more about what we can do to take back our time so that we’re spending it on the things that matter most to us. Until then, I’d love to hear how things are going with you. How are your daily and weekly top three tasks coming along? Has anyone had a chance to use the daily planners yet? Previous Post: « Feeling Scattered? Just Dump It! This is a great idea. I do not think most people really think about how or where they are spending their time. Starting with the 24 hours we have really helps to put things into perspective. I am going through a transition and am trying to work through how I currently spend my time and how I want to be spending my time. What brings value to my life and what needs to go. Even though I did this 2 years ago, it is time for a refresh. I printed your chart and am using it to help me do an assessment. (thanks!) Sharing this with others. It really does make a difference when we start looking at our time in those 24 hours chunks doesn’t it? I was surprised at how much time I waste on things in day. I think it’s an important thing to come back to once in a while to evaluate and make sure we’re on track. I’m thrilled that you found the worksheet helpful. I hope it helps you finds the right solution that will work for you. I was really enjoying going through the 31 days to sanity. I am just a little confused as I do not see anything after day 17.